Are you planning to travel to the Gili Islands in Indonesia? Find here the most frequently asked questions. Can’t find the answer to your questions? Or do you need help with organizing your trip, activity or accommodation? Just send an email to Favoriteplaces@Gilis.Asia or send us a message via Facebook or Instagram. It’s our pleasure to share our knowledge with you! Feel free to share the sunshine! What is the best way to get to the Gili Islands from Bali? 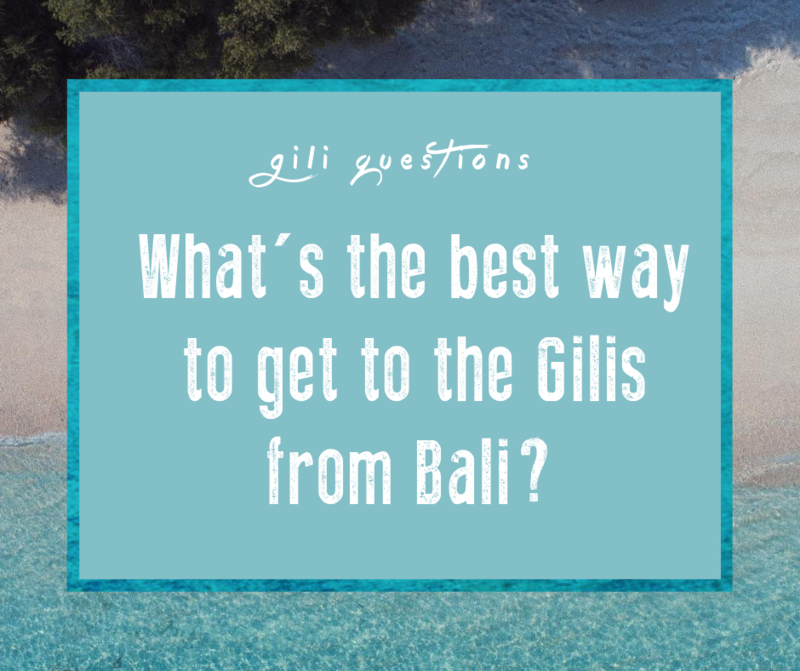 One of the main reasons nobody should miss out on a trip to the Gilis is that getting to the Gili Islands from both Bali and Lombok is easy and quick! Coming from Bali you can take a fast boat (1.5 – 2 hour) ferry (5 hours) or if you want to travel like a superstar you can even take a helicopter (45min). Click here for more detailed info how to get to the Gili Islands from Bali. What is the best way to get to the Gili Islands from Lombok? From 7AM till 5PM you can take a public boat from Bangsal to one of the Gili Islands. The price is around IDR 15.000 – 20.000 and the boat leaves once they are full, minimum 30 people. The best chances of getting a boat quickly without waiting for hours are in the morning and afternoon. If you don’t want to wait or if you need a boat between 5PM and 7AM just charter your own speedboat from Teluk Nara. For more detailed information on how to get to the Gili Islands from Lombok, visit our page Getting to Gili Islands. What is the best way to travel from one island to another? It’s easy to travel from one island to the other. From each Gili Island there is an island hopper boat leaving in the morning and returning in the afternoon. On each island you also have the option to charter your own boat at any time. For the exact times and prices ask the tourist information desk in the harbours of the Gili Islands. 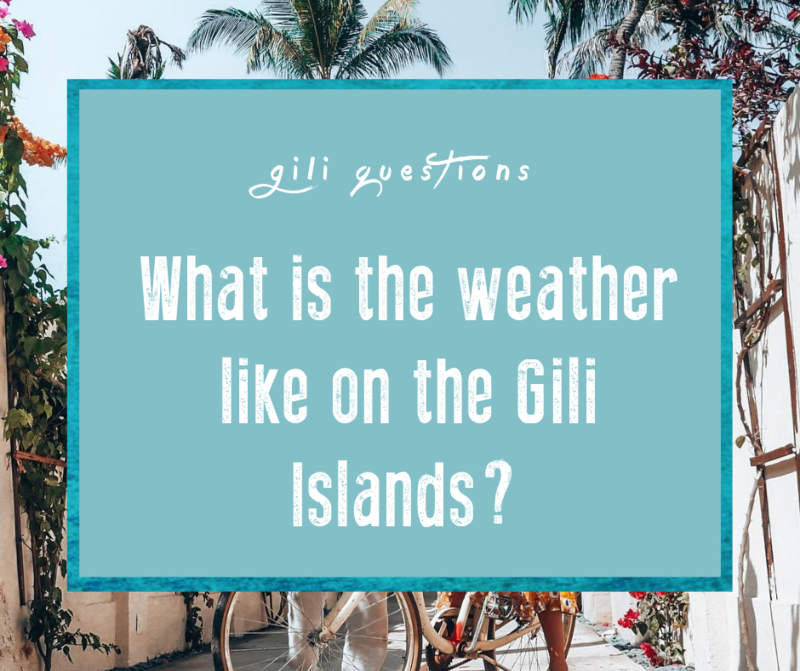 What is the weather like on the Gili Islands? Rainy season is from November till March but don’t let this hold you back to visit the Gili Islands. Rainy season doesn’t mean its raining every day, all day. The rain mostly falls by the end of the afternoon. And to share a little secret with you: there is no better feeling than a natural shower after a long hot day on the beach. The average temperature is between 27 C and 32C and the average humidity is 70%. When is high season on the Gili Islands? Most people are visiting the Gili Islands in December, January, July, August and September. In these peak periods the islands can be fully booked, so please make sure you book your accommodation in advance or bring your hammock and sleep under the stars. 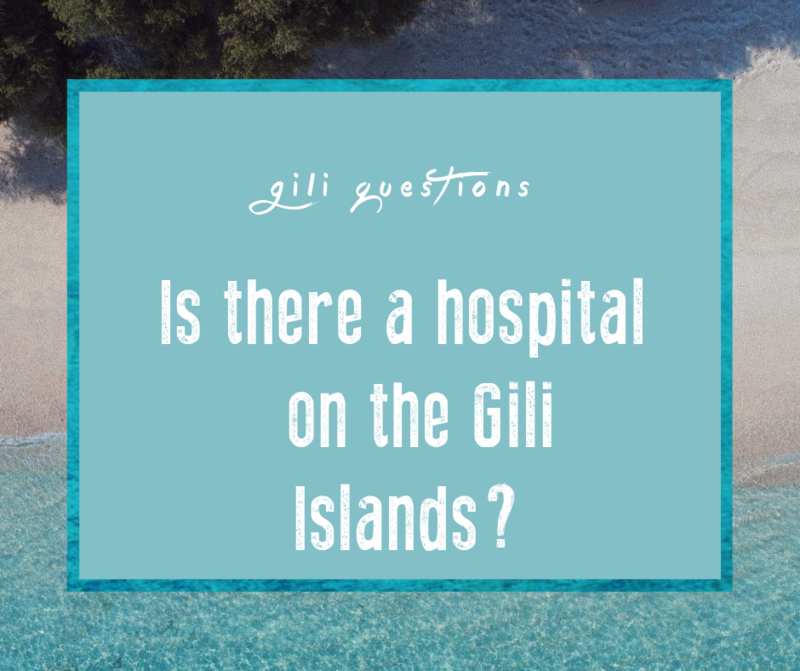 Is there a hospital / clinic / doctor on the Gili Islands? Do I need a visa for Indonesia? The Indonesia Government has granted 52 countries to be able to get a 30 days visa on arrival for free! Make sure your passport is valid for a minimum of 6 (six) months from the date of arrival in Indonesia. You will receive your visa at the immigration desk at the airport / seaport. Tourist visas are valid for 30 days, your arrival day is counted as your first day, and you must leave the country on the 30th day. Your 30 days free visa on arrival is not extendible and not convertible into other types of visa. If you are planning to stay longer than 30 days or are not sure how long you will stay we would advise you to get a $US 30 visa on arrival which is extendible for another 30 days. If you think 30 days is not enough to discover all the magic of the Gili Islands and the rest of Indonesia you should apply for a 60 day tourist visa at the Indonesian Embassy upon your arrival in Indonesia. When you overstay your visa you incur a penalty of US$20 per day for under 60 days over-stay. More than 60 days over-stay may incur a 5 (five) year prison sentence or a fine of IDR 25.000.000. In which time zone are the Gili Islands? As you are on holiday you should switch off your phone and leave your laptop at home ; _ )If you really want to know what time it is: choose GMT + 08.00 Jakarta/Singapore on your device. What’s the average price for accommodation on the Gili Islands? Prices of accommodation run between IDR 150.000 for a dorm room to IDR 10 million for your own private villa, it all depends what you’re looking for. But we can already tell you: there is something for everyone! Whether you are looking for cheap, budget lodging like homestays, guest houses and bungalows or more exclusive, upmarket cottages, villas and hotels. Should I be concerned about Malaria on the Gili Islands? 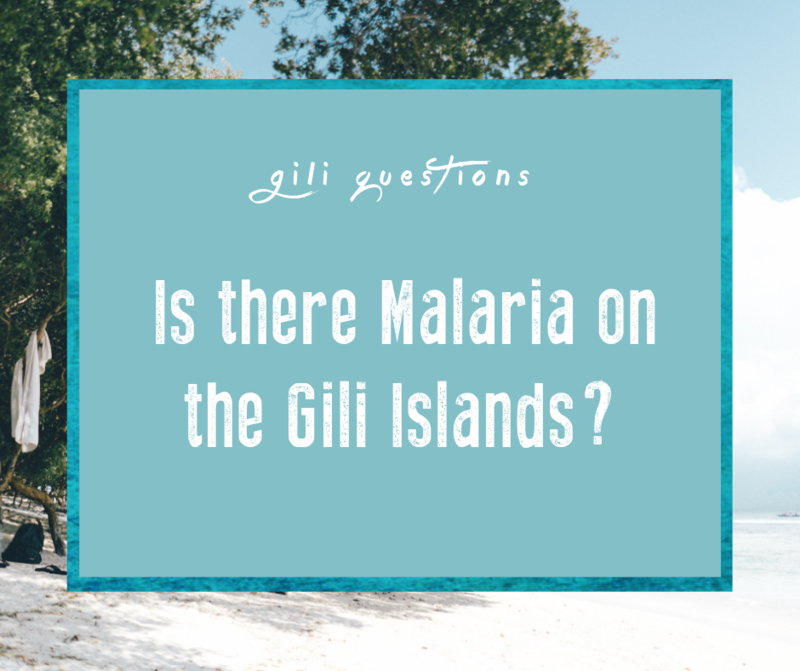 Although there is malaria throughout Indonesia, the risk to travellers staying on the Gili islands is quite small and prevention by malaria tablets is usually not prescribed. Check with your local health authority for the latest recommendations. Use repellents, cover your body around sunrise/sunset and sleep underneath a mosquito net. What is the local currency on the Gili Islands? The local currency is Indonesian Rupiah (IDR). Keep in mind that there are a lot of zeros in the currency and it can be confusing. IDR 1,000,000 (yes, million) is roughly equal to USD$ 70, EURO€ 60, GBP£ 45, AUS$ 100. 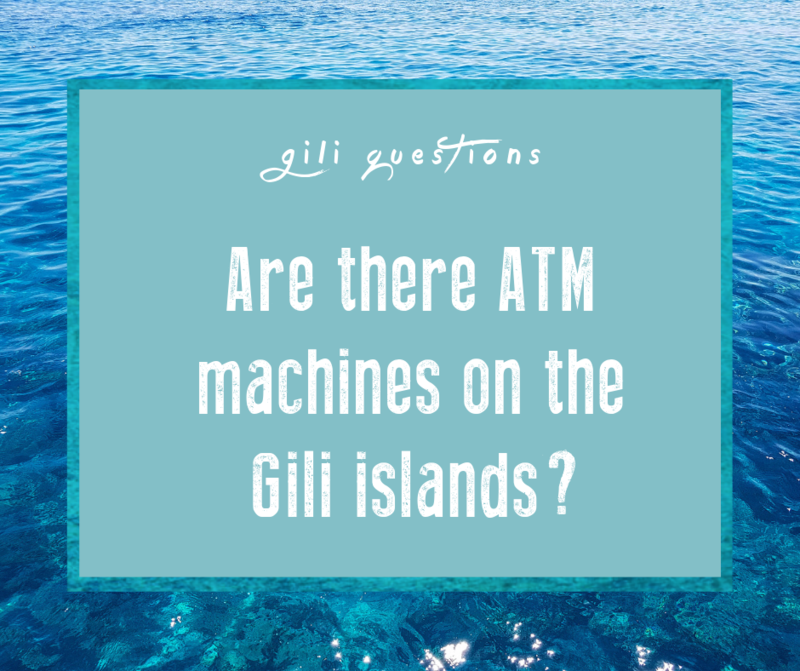 Are there ATM machines on the Gili Islands? Gili Trawangan, Gili Meno and Gili Air have several ATM machines. ATM withdrawal limits per transaction are usually quite low (IDR 1,500,000 – 3,000,000) due to the fact that the largest note in Indonesia is equivalent of USD$10 and the ATM opening is only so big… But don’t worry, the machines allow you to make multiple withdrawal transactions in 1 visit. There are also several money changers on all Gili Islands, but chances are big that you don’t get the same exchange rate as in Bali or in Lombok. To avoid disappointment, exchange your money before your visit and change money at official money changers and/or banks. What kind of activities can I do on the Gili Islands? The better question would be: what can you not do in the Gili Islands? The three islands, surrounded by a beautiful blue and turquoise ocean full of coral and marine life, are the perfect place for all kind of water sport. Subwing, Diving, Freediving, Snorkeling, Swimming, Surfing, Kitesurfing, Stand Up Paddling, Sea Kayaking. Be aware that there can be very strong currents around the Gili Islands and although you might think you’re superman, never try to swim from one island to the other. Besides spending your day in the ocean feeling like a mermaid you can connect to your mind and spirit by doing yoga, improve your cooking skills by attending a cooking class, feel the wind in your hair while you’re horse riding on the beach, rent a bike and discover the secret hidden places on the island, go with your (new) friends on a party boat and much more. You can find all things to do on the Gili Islands here. 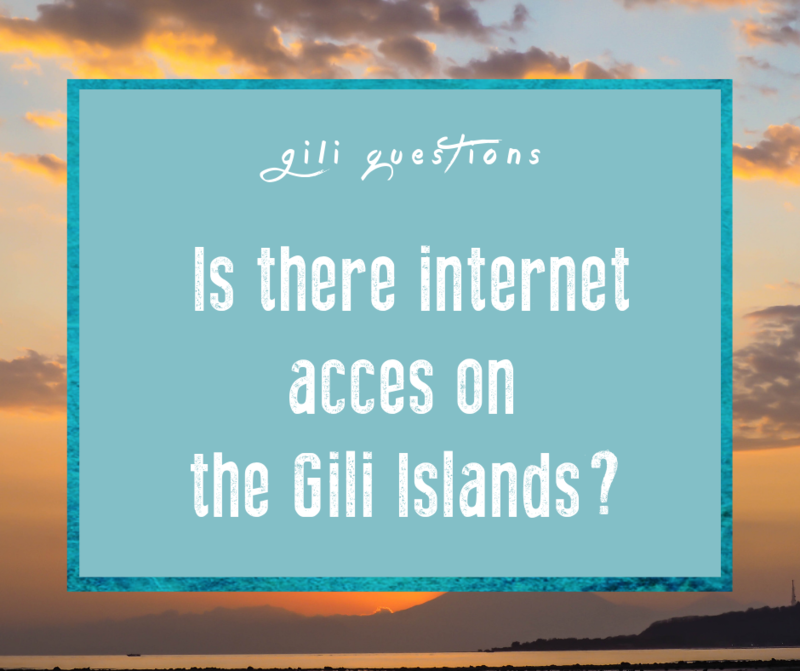 Is there internet access on the Gili Islands? Most of the restaurants and hotels on the Gili Island offer free WIFI. If you want to stay connected trough out your whole stay we advise you to buy a local sim card. For an average of IDR 100.000 you can get a sim card and a internet package that will last a month.